A photo of the Ed McLaughlin, owned by McGinnis Marine, capsized on the Ohio River at mile marker 259 on Friday near Cheshire. 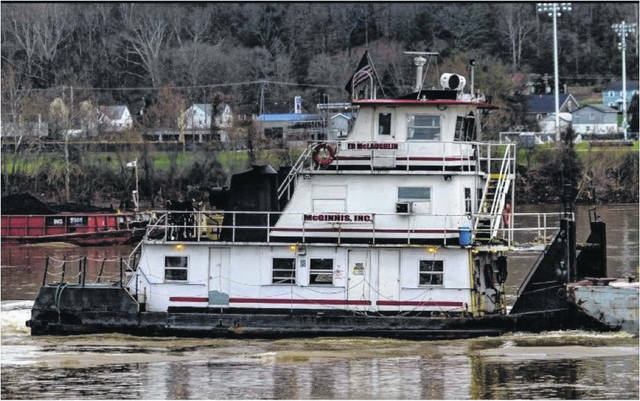 CHESHIRE — A towboat that sank on Friday near the village of Cheshire remains in the Ohio River, according to the United States Coast Guard. Due to a strong river current, and rising water, the USCG is monitoring the situation with a crew on scene, according to Petty Officer Third Class Lexie Preston, with public affairs. Later Friday evening, Preston said though there was that “light sheening” around the vessel, the source of the sheening was unknown. At that time on Friday, no active fuel leaks had been discovered. On Monday, Preston reported the “light sheening” had remained around the vessel and this leads the Coast Guard to believe there could be “some kind of discharge,” leaking but just what the discharge is or the discharge rate is unknown. Part of this is due to water conditions making it difficult for investigators and responders at the scene. Besides monitoring the situation, “there really isn’t anything that can be done until the current slows down,” Preston said, adding the Coast Guard, along with its crew currently on scene monitoring the situation, also has a mitigation team on standby to mitigate any risk of fuel leakage. What caused this incident remains under investigation.